Dr. Mom is at work overnight once again; so, we were going to go to Kirin Court earlier for dim sum but that turned into a fiasco. We showed up to a nearly 1 hour wait. People were lined up everywhere. Cars were around the block. Top it off with the fact it is on the second floor with waiting only available on the kid unsafe balcony and you get no Kirin Court for Sunday dim sum. So it was to be dinner alone with the kids. I decided to try and cheer up Mommy after she missed her anticipated dim sum by bringing dinner. So I came up with Eatzi’s. I figured we’d eat there and then bring Mommy something to go. I had gotten food to go when I used to work downtown and as far as I remembered this would be a good choice. 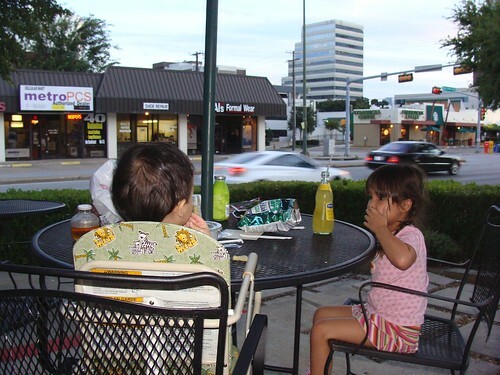 I haul the kids down to Eatzi’s on Oak Lawn. The first fiasco is parking. I luckily get a decent spot near the front but not kid safe walking here. I have Benji plus his ever-handy clip on chair in one arm and am holding Mina’s hand in the other. Since this is pretty much a mini grocery story I go to grab a cart. Turns out these carts won’t be doing much good to ease the load. There is no place for Benji to sit and I certainly can’t let him walk in here with wine bottles within his reach. Luckily, I can at least drop his chair in the lower part of the cart. 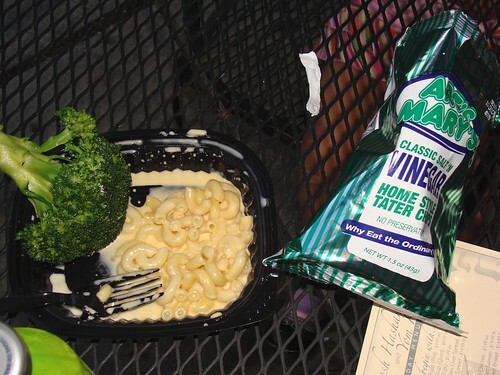 Mina spots the prepared items in the center and decides she wants pasta, shrimp and broccoli. Not a bad choice, I think to myself. I soon realize that that won’t be happening because it will be cold. Mina is adamant until I tell her if she wants it, it will be cold. That ends that discussion. So, while all these items look good, seems like the only real choices are sandwiches or salads. That’s disappointing. Then I spot the grill and navigate through the extremely cramped quarters. I have to carry Benji the whole time and keep a keen eye on Mina with all the breakable items and carts roaming the small aisles. They have Mac and Cheese, so that’s what Mina is having. I add on her broccoli. Not really wanting a salad, I figure I am having a sandwich. 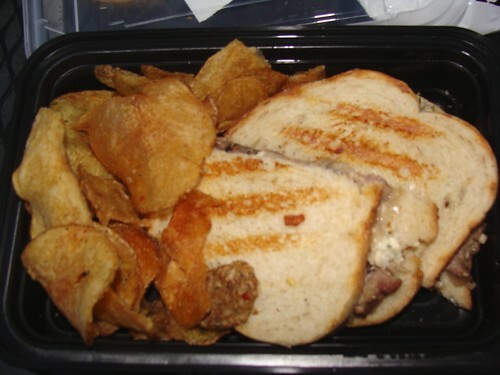 They have a Steak Panini that sounds interesting, so I opt for that. Benji spots some yogurt, so I get him some of that, seeing that Mina’s “side” of mac and cheese is extremely small. Mina says she wants some, too, so I get her one. Interestingly, they carry Lucky Layla yogurt drinks so I grab a small one for myself. I get Mina a bag of salt and vinegar chips (mainly to see if it will be worthwhile to take to Grace later). My arm is getting tired and Mina is getting in everyone’s way so we grab a few drinks to make our exit. Wait! First I have to navigate back to the deli counter to get something for Benji to drink out of, seeing as the only drink available for Benji was a glass container of apple juice. If you think the rest of the store is cramped, check it out back here. I get the cup of ice and we check out. I am envisioning how ridiculously inconvenient this place would be at lunchtime on a weekday. Every place a line forms would just create a backup into another section where a line should form. I get the total and its $35!!! And that’s just for the kids and me. We haven’t even ordered Mommy’s food yet and Benji only got yogurt and apple juice. I recover from shock and go out to the patio to eat. Forget eating on the mini tables with high stools inside with children. Once I get to the patio, I notice the kids have a beeline directly into traffic. That’s not good. So I sit back closer to the store. Seating isn’t that great but I am glad to be freeing up my hands. I already have my kid friendless rating formed for this experience. I get Mina started on hers and dish out a little of the mac to Benji. Benji doesn’t seem hungry but he does eat thru half his yogurt. Mina’s mac and cheese portion is so small she actually eats it all. I eat my average sized sandwich and skip ahead to my yogurt drink as the bottled tea I chose was absolutely disgusting (not counting this against them as its not their product though they did choose to carry this foul beverage). Mina wants to play but its only a hop skip and one stair to high speed traffic so that’s a no go. $3 worth of mac and cheese? Its almost lucky that the meal was so small as I am getting devoured by mosquitos. I am sure the kids are, as well, so I keep a eye on their limbs so I can kill any that try. 10 bites of sandwich and 10 mosquito bites later, its time to go. Still have to get Mommy’s food, so I drop off everything possible at the car before attempting to navigate the store a second time. I was going to call Grace to see what she might want but after paying 7 bucks for a side of cucumber salad with my meal, I opt to get her a sandwich. I know her that well, although she might try to disagree. I opt for the 3 inch sandwich for 7 bucks. Wait. What! 3 inches for 7 bucks! This better be the best sandwich ever. I ask for ham, salami, and proscuitto and they want to charge me $2 per each meat selection over just one. One meat doesn’t sound gourmet to me. I complain that it is absurd to double my sandwich cost for several types of meat rather than just one even though I am getting the same amount of meat. They relent so her 3 inch sandwich with a bag of chips and a 20oz Fanta is only 10 bucks! Time to deliver the goods and get home. The food selection was quite similar to what you’d find at Central Market except vastly smaller and I’m estimating about 50% more expensive. My sandwich was good but nothing spectacular, especially for the $8 price tag. The deli/salad area wasn’t anything special ingredient wise. If you are wanting a sandwich you’ll get a better selection with quality meats at Great Outdoors and you’ll save a bundle. Some of these items, I am sure, are fine to take home but most you won’t be eating here as they require some prep. The cold cucumber salad I got was not spectacular as it should have been for $10/lb. We’re talking cucumbers here so a small side will run run around $7 like mine. I found myself wondering their profit margin on the salad more than savoring the flavor. Some of the grocery items they carry are selections I have had and are no question, gourmet, but just as they get negatives for the nasty bottled tea, they aren’t getting any pluses here either. Total Cost: You can do the math. I don’t want to think about it anymore. Forget about it. There is no food aimed for children here. You can get them a sandwich but be prepared to spend $7 dollars on it. They had mac and cheese by chance on this visit but the portion I got was $3 and a quarter the size you’d get elsewhere. They carry yogurt and you can get cut fruit. Besides that, you may have to stop by McDonald’s. Top that off with the non-existent child seating, the fact that your child could easily bolt into traffic while eating, and the non kid-friendly shopping experience. If you do attempt to eat here, bring your Deep Woods Off. I think I tripled my risk of West Nile on this outing. The plus is I got to try some of the dairy products from Lucky Layla Farms. Its basically the last farm in Plano. Its right across from Collin County Community College on Park/Jupiter. That was a tasty yogurt drink. Besides that, if it weren’t against The Rules, I would have gone back to Izmir Deli to bring the wife dinner. Citysearch gave it one dollar sign and 4.5 stars?!. Not sure how they arrived at either of those conclusions. i liked my sandwich. (thanks team phipps!) of course, if i didn’t have that, i would have eaten hospital cafeteria food. i think eatzi’s is supposed to be gourmet food to go, anyway. maybe that’s why i had a better “experience”?! It was going to be 14 bucks. I had to talk them down. I happened upon your blog from a mom’s board and wow, it is great! 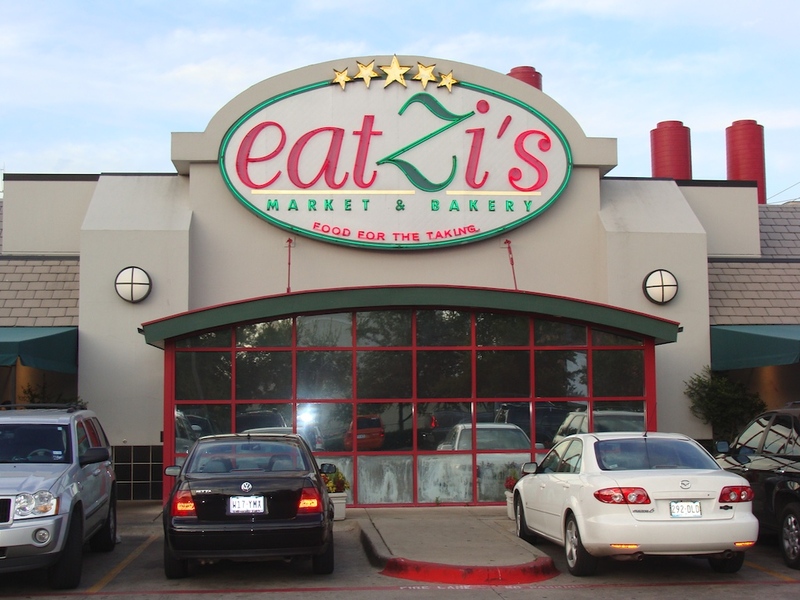 I’m sorry you had such a lousy Eatzi’s experience. I eat there often with my 20 month old. I usually put him in his stroller to navigate the store and it provides a safe place for him to eat outside. A few of his favorites…sun dried tomato pasta salad, fresh fruit, whole wheat bread, focaccia, and veggies from the grill. Hope your next trip there isn’t as rough! my husband still won’t stop talking about his bad experience. i thought my sandwich was good and would consider stopping in before work to get something to go -of course, that’d be without the kids. a stroller to keep the littler ones safe is a great idea, even my jaded husband agreed that would’ve made things easier.